An Orbital Minotaur IV+ rocket has launched from Kodiak Island, Alaska, on Tuesday, carrying an experimental communications satellite for the United States Navy and Operationally Responsive Space Office. Liftoff was on schedule at 15:49 UTC (07:49 local time). TacSat-4 is the third in a series of experimental satellites intended to demonstrate new technologies for the US military. The first spacecraft, TacSat-2, was launched on 16 December 2006. The satellite demonstrated the Earth Surface Imager, or ESI, along with ten other experiments. Whilst the mission was considered to have been successful, it was reported that some of the sensors could not be tested for several months due to a dispute between the US Navy and National Reconnaissance Office; it remains unclear if they were ever activated. TacSat-2 decayed from orbit on 5 February 2011, having ceased to operate in January 2008. TacSat-3 was launched in May 2009, and is equipped with the Advanced Responsive Tactically Effective Military Imaging Spectrometer, or Artemis, a hyperspectral imaging experiment. It has been reported that after the experimental operation of the sensor was completed, the spacecraft was brought into service as it was found to be able to locate roadside bombs and underground tunnels. TacSat-1, which was originally intended to be the first TacSat spacecraft, was never launched. It was intended to demonstrate the provision of infrared and optical images directly to troops on the battlefield, however its launch was repeatedly delayed, and most of its mission was completed by TacSat-2, leading to it being declared obsolete. In addition to operating its own spacecraft, the US military used the British TopSat spacecraft for a series of tests associated with the TacSat programme, for which it was identified as TacSat-0. TacSat-4, also known as the Tactical Microsatellite Innovative Naval Prototype, or INP, was developed under a new US Navy policy of increased investment in spacecraft technology development. TacSat-4 is a 450 kilogram satellite, powered by twin solar arrays generating one kilowatt of power. It is equipped with a 3.66 metre (12 foot) high-gain ultra high frequency (UHF) antenna, which will provide ten communications channels to augment those provided by geosynchronous communications satellites. The Minotaur IV+ is one of several configurations of the Minotaur IV, a family of rockets derived from the LGM-118A Peacekeeper missile developed in the 1970s as part of the Missile-X, or MX, programme. The Peacekeeper was originally designed to be moved around to prevent a first strike attack against US missiles; they would either have been deployed using mobile launchers, or extracted from their silos and moved to other ones. These concepts had been abandoned by 1983, and instead it was decided to base the Peacekeepers in existing silos, which were designed for Minuteman missiles. A new programme was started to replace the planned mobile capability of the Peacekeeper, which led to the aborted Midgetman programme in the early 1990s. The first of fifty one Peacekeeper launches occurred on 18 June 1983. In 2004 the missile was withdrawn from service under the terms of the START-II treaty, with the last missile being removed in September 2005. In total, 114 missiles were built, and the surplus components have since been used for several new rockets including the Minotaur IV, Taurus and the Orion Abort Test Booster. The first three stages of the Minotaur IV are the same as the Peacekeeper’s, and all three burn solid fuel. The first stage is a Thiokol-built SR118 motor, which is also known as a TU-903. An Aerojet SR119 motor is the second stage, whilst the third stage is a Hercules Incorporated SR120. The Postboost Axial Thruster, which was used as the fourth stage of the Peacekeeper, was fuelled by hypergolic propellants; dinitrogen tetroxide and monomethylhydrazine; and powered by an RS-34 engine. Each missile would have been armed with up to ten 300-kiloton W87 thermonuclear warheads contained within independently-targeted Mk.21 reentry vehicles. The Minotaur IV omits the Postboost Axial Thruster; instead most configurations have an additional solid rocket motor. The Minotaur IV Lite is used for suborbital launches, and is a three stage vehicle without any solid motor replacing the Axial Thruster. The standard Minotaur IV has an Orion-38 fourth stage, whilst the Minotaur IV+, which will be used to launch TacSat-4, has a Star-48V as its fourth stage. For some payloads, a Hydrazine Auxiliary Propulsion Stage (HAPS) fifth stage may be flown, however this will not be used for the TacSat-4 launch. The Minotaur IV a member of the Minotaur family of rockets, which are operated by Orbital Sciences Corporation, and includes five rockets derived from retired Intercontinental Ballistic Missiles to launch US government payloads on suborbital and orbital missions. Tuesday’s launch marks the twenty third flight of a Minotaur rocket, the fifth flight of the Minotaur IV, and the maiden flight of the Minotaur IV+. The Minotaur III and Minotaur V are both derived from the Peacekeeper missile, like the Minotaur IV. The Minotaur III consists of the first three stages of a Peacekeeper, with a Super-HAPS fourth stage. No Minotaur III launches are currently known to be scheduled; the planned launch of the HTV-1 hypersonic experiment was cancelled. The Minotaur V is a five-stage rocket based on the Minotaur IV+, but with a Star-37 motor as a fifth stage. 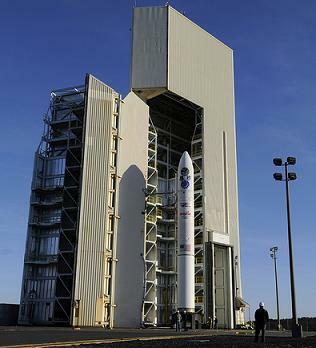 The first flight of the Minotaur V is scheduled for 2013, with NASA’s LADEE spacecraft bound for the Moon. The older members of the family, the Minotaur I and II, are derived from the LGM-30F Minuteman II missile, and have been flying since 2000. The Minotaur I was the Minotaur to fly, and is typically used to place small satellites into low Earth orbits. To date ten have been launched. The Minotaur II, which has also been known as the “Chimera”, is used for suborbital flights to provide targets for tests of missile defence sensors and interceptors. Eight have been launched. 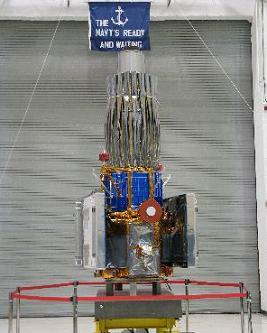 TacSat-4 was launched from Launch Pad 1 at the Kodiak Launch Complex in Alaska. Kodiak is a commercial spaceport which is operated by the Alaska Aerospace Corporation. Tuesday’s launch was the third orbital launch from the facility, with the first being the “Kodiak Star” mission launched by an Athena I in 2001, and the second being STP-S26 last November using a Minotaur IV. Several suborbital launches have also been made from Kodiak, among them two AITs, two Ares, and eight STARS rockets. The launch of TacSat-4 began with the ignition of the Minotaur’s first stage when the countdown reaches zero. The rocket then begin its ascent to orbit, passing through the area of maximum aerodynamic pressure thirty seven seconds later. Fifty seconds after launch the first stage separated from the vehicle and the second stage ignited to begin a fifty eight second burn. Following burnout of the second stage, the Minotaur coasted for ten seconds before the spent stage is jettisoned, and the third stage ignited. The third stage’s burn lasted for around a minute and thirteen seconds. Twelve seconds after ignition, the payload fairing was separated from around the spacecraft. Once the third stage burnt out, a coast phase began. Nineteen minutes and 37 seconds after beginning the coast phase, the third stage separated, with the fourth stage igniting eleven seconds later to conduct an eighty-two second burn. Three minutes and twenty seconds after the fourth stage burn is complete, TacSat-4 separated from the Minotaur IV. The spacecraft is expected to be deployed into an elliptical medium Earth orbit with a perigee of 185 kilometres, an apogee of 12,050 kilometres and 63.4 degrees of inclination. TacSat-4’s launch marks the fourth and final Minotaur launch planned to occur this year. Orbital Sciences’ next launch is expected to be the maiden flight of the Taurus II rocket, which is currently scheduled to occur in December.